In this month’s newsletter, we are pleased to share the results of our 2017 customer satisfaction survey, with positive feedback overall and interesting trends. This year’s survey report coincides with Siveco upgrading its certification to ISO 9001:2015. All our customers have received a detailed survey report with improvement actions. 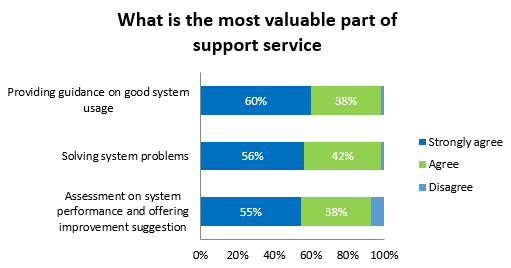 Over 95% of customers under support took the time to respond to the survey, representing around 400 clients. 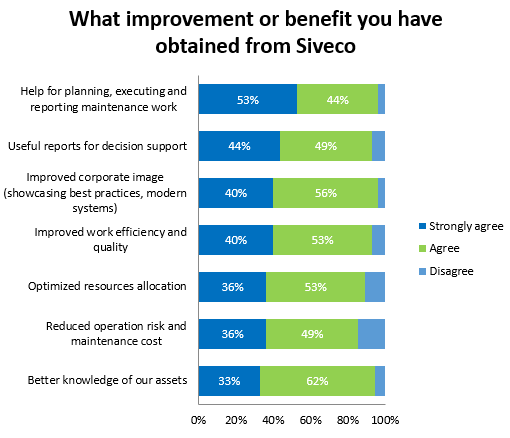 56% of responses come from managers, showing that maintenance is getting more attention from management, a trend already identified in the “Maintenance in China 2017” survey conducted by Siveco & Shanghai University. A pioneer of Maintenance 4.0, Siveco supports maintenance improvement with integrated cloud and mobile solutions based on: Coswin, bluebee® and bluebee® cloud. Siveco solutions benefit from a long history, over 30 years from Coswin, over 10 years for bluebee® and bluebee® cloud. 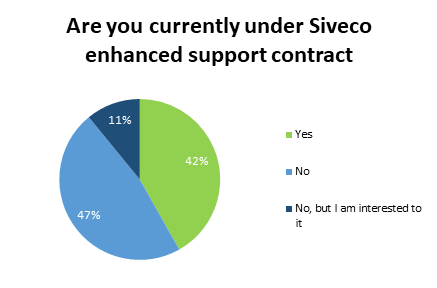 As markets and technologies keep changing, Siveco propose a clear and proven upgrade path for all products, to support customers with their improvement needs for decades to come, which is considered a key strength of Siveco. The Coswin 8i upgrade campaign has shown good results (yet some clients chose to remain in version 7i) and the number of bluebee® and bluebee® cloud licenses has continued to increase (note that customers using our mobile solution naturally have more users). This trend is expected to continue next year, as several large bluebee® contracts signed in 2017 will come under support. During 2017, all actions planned based on the results of the 2016 survey have been completed. In particular, the support team has run a proactive campaign to upgrade Coswin 7i clients to Coswin 8i and “Open Class” training sessions have been conducted at the Siveco Shanghai office every quarter. 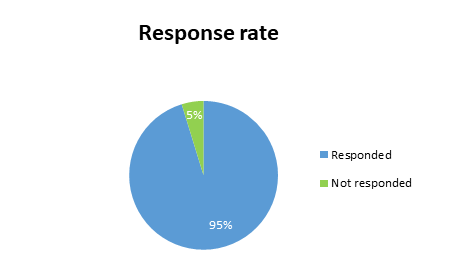 Compared to 2016, responses show sharp improvement in terms of response time (“strongly agree” went from 43% to 73%) and easy communication (from 43% to 64%), while others remain stable. Previous years surveys showed that training is considered one of the most critical success factors. During 2017, additional efforts were put to offer additional training to clients, including quarterly Open Class training for customers under Enhanced contracts. 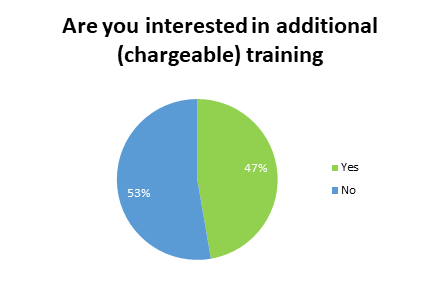 After the survey was completed, two customers have already signed up for such chargeable training based on their specific needs. At the end of 2017, Siveco also launched its new bluehoney offering, an online training program on maintenance management; see the Product section for more. The Coswin CMMS, now in its Coswin 8i version, has a long history dating back to the 1980s. 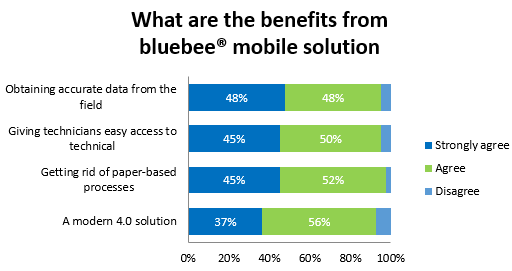 Since 2008, Siveco pioneered the development of standard mobile solutions for Operation & Maintenance, the bluebee® suite, which explains the large proportion of Siveco client using mobile solutions. Although questions were slightly different from the 2016 survey, the percentage of “strongly agree” responses has increased very significantly. 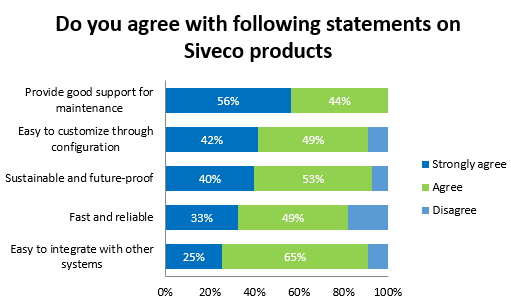 Based on previous years’ surveys, during 2017, Siveco China R&D team continued to focus on improving the reliability and configurability of our solutions. This included giving suggestions to clients on setting up their IT infrastructure, which sometimes negatively impact performance. QR code scanning using WeChat is the “champion”, which several of our multisite customers are already using to expand the system to operation teams. Meter reading is an example of key feature present in bluebee® since 2008, but sometimes not used or not known by clients. Generally, we see that clients using bluebee® for operational support (such as operation checks, audits, meter readings etc.) are less aware of its maintenance-related features, and conversely. The newly-launched bluehoney online training course takes the second position. Siveco’s first online maintenance training, drawing on ISO 55000 (GB/T 33172) and Siveco’s long experience, has already been adopted by 8 customers in 2017 and should reach over 30 in the coming months. For more on bluehoney, see the announcement: “Siveco releases bluehoney, Siveco’s first online training for Maintenance Management”. 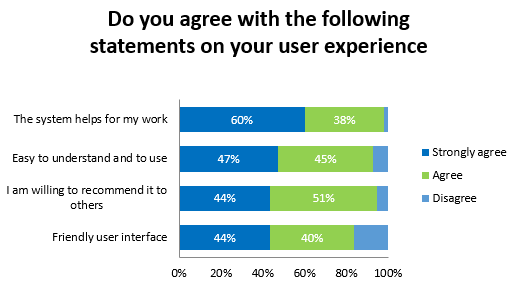 Compared to similar questions asked in 2016, responses show increasing interest in “high-tech” features. 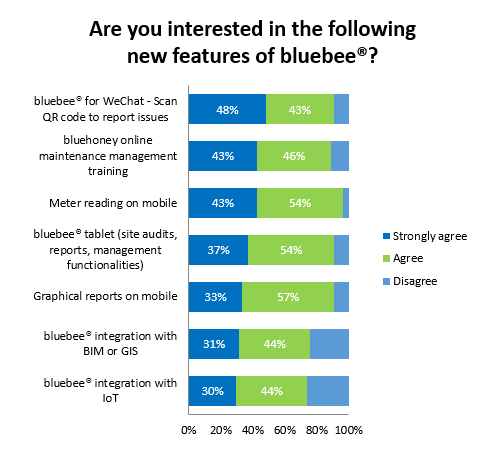 Based on sales and project experience, Siveco indeed observes that customers once reluctant to accept new ideas (traditional preference for PC-based CMMS and work-orders on printed paper) have now become more and more open to the technological advances and benefits of bluebee® (also see the next section of the survey for benefits). 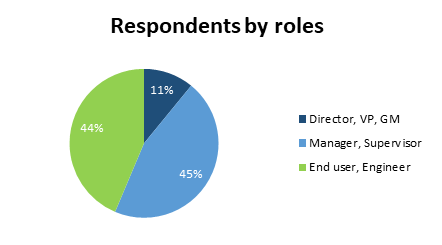 Several survey questions explored the benefits obtained by clients. While execution benefits rank the highest, responses show that companies derive corporate value from Siveco products and services. This is consistent with trends observed in our 2017 Maintenance in China survey, with maintenance seen as “industrial risk prevention” well-aligned with the nation’s sustainable development objectives. 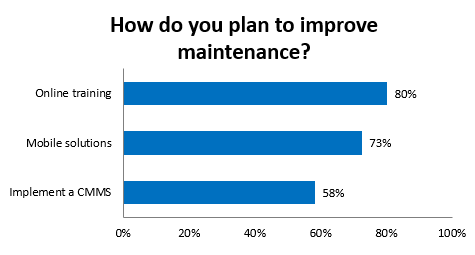 The results above are again consistent with the “2017 Maintenance in China survey”, where 73% of respondents declared they plan to improve maintenance by using mobile solutions. The purpose of the survey is to constantly improve our customer service. 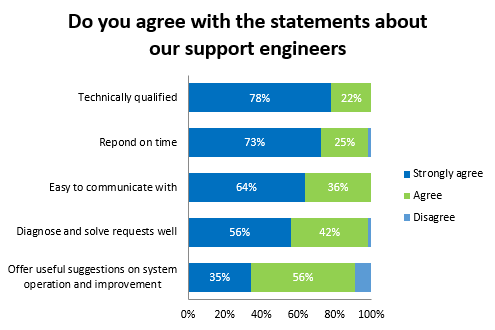 As a result of this survey, improvement actions for 2017 have been defined based on our findings and will be managed by our Customer Service team as part of the company’s quality management process. A more detailed report was also sent to all customers, along with a list of improvement actions taken in 2017 (based on last year’s survey) and actions planned for 2018.